Vincent Olivieri is a Composer and Sound Designer with credits throughout the United States and internationally. He lives with his wife and their daughter. And their plants. Vincent has designed sound and composed music for theatrical productions in New York City and around the country. In New York, his Broadway credits include the design & score for HIGH and contributions to August Wilson’s RADIO GOLF. Off-Broadway credits include THE WATER’S EDGE at Second Stage, THE BROTHERS SIZE at The Public Theatre, THE GOD BOTHERERS at 59e59, FATAL ATTRACTION: A GREEK TRAGEDY, and the Pulitzer Prize finalist OMNIUM-GATHERUM. In addition to his off-Broadway designs, his New York credits include productions with Gorilla Productions, Black Jacket Productions, Word on the Street Productions, and Art Meets Commerce. Regionally, his wide range of theatre & composition credits include NOISES OFF & THE HEIRESS at South Coast Repertory, JITNEY at The Pasadena Playhouse, LAST TRAIN TO NIBROC, and TIGERS BE STILL (for which he won a League of Cincinnati Theatres Award) with Cincinnati Playhouse in the Park, RADIO GOLF & RABBIT HOLE at Pittsburgh Public Theatre, HAY FEVER and PERMANENT COLLECTION at Baltimore’s Center Stage, CURSE OF THE STARVING CLASS and HAY FEVER at Yale Repertory Theatre, GEM OF THE OCEAN at Milwaukee Repertory Theatre, VENUS IN FUR, THE UNDERSTUDY, SHAKESPEARE’S R&J, and DRIVING MISS DAISY at Theatreworks Hartford, WONDER OF THE WORLD and FULLY COMMITTED at Barrington Stage Company, INTIMATE APPAREL and JITNEY at Indiana Repertory Theatre & Syracuse Stage, INSURRECTION: HOLDING HISTORY at Berkshire Theatre Festival & Theatre Alliance, SPLITTIN’ THE RAFT at People’s Light and Theatre Company in Philadelphia, AS YOU LIKE IT and HAMLET at Opera House Arts, DELIRIUM FOR TWO with Theatre Novi Most, and TREASURE ISLAND and KING LEAR: THE STORM AT HOME at Virginia Stage Company. Vincent has a particular interest in new play development, and in addition to his work at the Humana Festival, he has created designs and scores for many new plays, including Matthew Lombardo’s HIGH at Theatreworks Hartford (subsequent productions at Cincinnati Playhouse in the Park, The Repertory Theatre of St. Louis, and on Broadway), Neil LaBute’s adapation of MISS JULIE, Rachel Bonds’ FIVE MILE LAKE, Michael Golamco’s BUILD, Keith Josef Adkins’ SAFE HOUSE, David Wiener’s EXTRAORDINARY CHAMBERS, Howard Korder’s IN A GARDEN, Sarah Treem’s FEMININE ENDING, and Lauren Gunderson’s EMILIE at South Coast Repertory Theatre, THE OLDEST STORY IN THE WORLD at Theatre Novi Most, THE AMERICAN OCCUPATION at The Juilliard School, THE BIRDS at Yale Repertory Theatre, and THIRTY GHOSTS at Ensemble Theatre Company in Cincinnati (for which he won a CEA Award). He co-designed and co-scored the premiere of Roberto Aguirre-Sacasa’s THE VELVET SKY at Woolly Mammoth Theatre Company in Washington DC. His music was heard in The New York Public’s production of Tarell Alvin McCraney’s THE BROTHERS SIZE. With The Clownzilla Theatre Troupe, he developed A HOLIDAY EXTRAVAGANZA, ILLEGAL ALIENS, CLOWN PLANET, and READY SET DEAD. He created the sound design and score for RAZBOIUL CLOVNILOR (WAR OF THE CLOWNS) and the new musical CLOVNI EXTRATERESTRI (CLOWN ALIENS) at Teatrul National Cluj in Cluj, Romania. He has workshopped new plays for The New York Theatre Workshop and New York Stage & Film. In 2005, Vincent created the sound design and original music for the world premiere of RADIO GOLF, the last play in August Wilson’s ten-play cycle chronicling the African-American experience in the twentieth century. 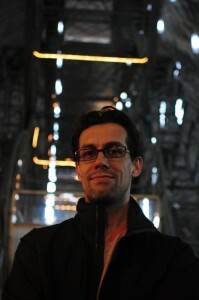 Vincent teaches at University of California-Irvine, where he serves as Head of Design and Head of Undergraduate Sound Design. Prior to joining the faculty at UCI, he taught, lectured, led workshops, or served as a guest artist at many colleges and universities including Auburn University, Barnard College, Bellarmine College, The Juilliard School, UMass-Amherst, and Yale University. He is an active member of the Sound Commission of USITT and a regular contributor to freesound.org. He has written a number of articles for trade magazines including Stage Directions and Lighting and Sound America. Vincent holds a BA in mathematics and a minor in music performance from the University of Richmond and an MFA in Sound Design from the Yale School of Drama.